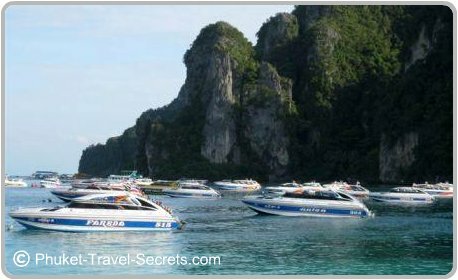 Speed boats are the quickest option from Phuket if you want to arrive at Phi Phi before the crowds? 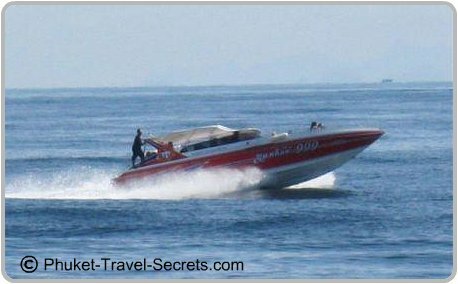 Throughout the high season when the seas are calm, speedboats to the islands are fast and fun. The boat trip takes no more then an hour from Phuket. However throughout the low season when the seas are not so calm, speedboats to the islands can be a body shaking experience. Even worse if you suffer from sea sickness. Speedboats are more then just a means of getting to the wonderful islands. 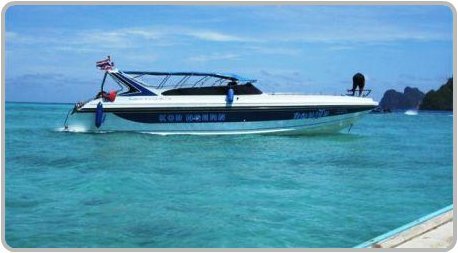 They are geared for tours and include transfers to and from your hotel, lunch at Phi Phi Don and snorkeling gear. These boat tours will take you to all the top beaches and islands like Maya Bay, and other beaches along the way. Some of the speedboats carry up to 20 passengers, and can at times be a little crowded. While speedboats are faster they are also more expensive then catching a regular passenger ferry, but are ideal for visitors who are strapped for time or don’t wish to stay overnight. If you are travelling with your own group of friends or family there are safe and comfortable private speedboats available for charter, that are worth looking into. These speedboats are much more comfortable and you get to pick where you want to spend extra time. 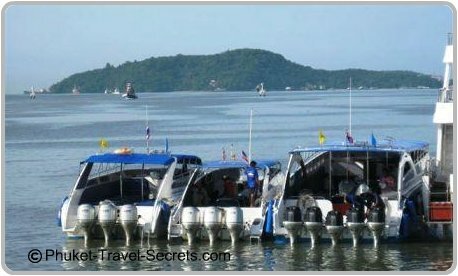 To book a speedboat to the islands you can visit one of the many travel agents or tour booking agencies in Phuket, or at your hotel. 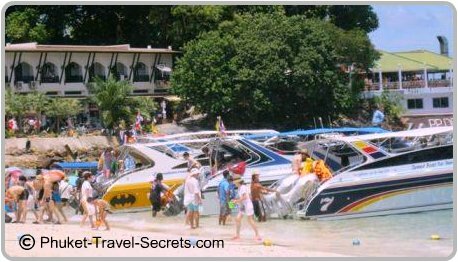 You will also find lots of speed boats and there vendors working the beaches in Phuket, that will be more then willing to take you and your group. The price for these boats will depend on how many people are in your group and how good your negotiating skills are. If you would prefer to book your speed boat tours prior to arriving in Phuket, click on the Easy Day Thailand link below to have a chat with our friends Diego & Ingo about the tour you would like to do while in Phuket. For visitors who are staying overnight on the Island, there are speedboats or longtail boats available for day trips. Naturally the speedboats are quicker but for a real Thai experience, ensure you take at least one trip in a longtail boat while in Thailand. Just make sure that the long tail boats are equipped with life jackets and snorkelling gear. If you are worried about sea sickness ensure you get some sea sickness tablets from the chemist before you depart. Speedboats are not advisable for pregnant women.